PepsiCo CEO Indra Nooyi Is Stepping Down After 12 Years "Leading PepsiCo has truly been the honor of my lifetime," Nooyi says. Under her leadership, the company shifted to selling more nutritious options such as hummus, juices and kombucha. Indra Nooyi, shown here at an event in 2011, plans to stay on as PepsiCo chairman until early 2019. Indra Nooyi of PepsiCo has announced that she is stepping aside as CEO after some 12 years at the helm. Nooyi plans to stay on as chairman until early 2019. The company's board announced Monday that it elected Ramon Laguarta, president of the company since 2017, to succeed her as CEO. PepsiCo prides itself on tapping its leadership from within — every other chief executive has come from its own ranks. "Today is a day of mixed emotions for me. This company has been my life for nearly a quarter century and part of my heart will always remain here," Nooyi, 62, said in a statement. "But I am proud of all we've done to position PepsiCo for success, confident that Ramon and his senior leadership team will continue prudently balancing short-term and long-term priorities, and excited for all the great things that are in store for this company." 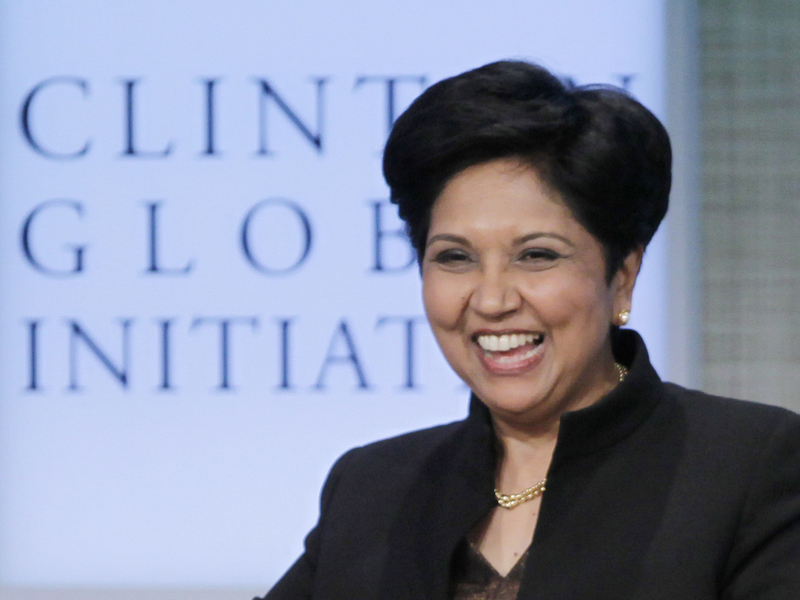 Nooyi's last day as CEO will be Oct. 3, according to the company. Under her leadership, the food and beverage giant dramatically repositioned itself toward selling more nutritious options, such as hummus, juices and kombucha. PepsiCo hails her as a pioneer among business leaders who promote sustainability and seek to "do well by doing good." She was promoted to CEO in 2006, not long before the mortgage crisis-fueled Great Recession. And as she steps aside, the company is highlighting her strong financial results. Shareholder returns rose 162 percent between December 2006 and December 2017. And the company's net revenue has grown from $35 billion in 2006 to $63.5 billion in 2017. Nooyi is a rare minority female CEO in the business world. As of May, according to Fortune, there were just 24 female chief executives of Fortune 500 companies. She grew up in Chennai, India. The Wall Street Journal notes that "during food shortages in the 1960s her middle-class family stood in line for rice rations studded with stones." In India, Nooyi played cricket as well as lead guitar in a rock band before heading to the Yale School of Management in 1978, according to Freakonomics Radio. She joined PepsiCo in 1994, rising through the ranks to become chief executive in 2006. In an interview with the program earlier this year, Nooyi described how different it felt to become CEO compared with other leadership positions. "When you become CEO, overnight you are the person calling all the shots, you're responsible for making sure you get all the information from the company, crystallize it down to, simple ideas, and then tell the organization what to do," she said. "Day one, you have to be ready to take on the mantle of being CEO." She said the shift toward healthier products required totally realigning the company's "innovation, marketing, execution and budgets" — and then changing the company's culture. "How are we going to attract women who are more than 50 percent of all the college graduates who are getting all the top grades? How are you going to attract women to the workforce, where we need them, but allow them to balance having a family and taking care of aging parents, because they're all part of a sandwich generation today, and still allow them to contribute productively to the workforce? I don't have an answer to that. It's got to be a concerted effort on the part of governments, societies, families, companies — all of us coming together."